The AGI Online Residential/Daily Living Course contains an incredible amount of information about the nature of autism and the many evidence-based supports that can be implemented to meet an individual’s needs. My involvement in this course is my first formal education about the nature of autism. I have spent a fair amount of time supporting people with autism in the past, but I have never really known much about the characteristics of autism and the specific supports that have been developed to support them. This increased understanding has led to very significant changes in how I support Jeremy. By far the most useful information I have received in this course had to do with the sensory challenges that are associated with autism. It has led me to take the sensory check-in with Jeremy at the beginning of each day much more seriously than I had. I used to forget to check in fairly often, but my newfound knowledge about sensory difficulties has caused me to make this a priority every time I support Jeremy at home. Also, it has become much easier for me to avoid taking behaviors personally when Jeremy becomes upset or anxious in certain situations. Because of the course, I am able to remind myself about how different his inner experience of sensory stimuli is compared to mine. When I do this, I don’t feel he is having difficult behaviors because I am not doing a good enough job. I just try to figure out the issue and often it is sensory related. As another benefit, my inner state is less affected by his outer state, and I am more able to maintain a calm presence while I am supporting Jeremy. Recently, he told me, “I’m really glad you are feeling more comfortable around me.” I feel confident that this increased comfort is largely due to this course and my newfound understanding of sensory difficulties. See photo (right): Matt supports Jeremy with regulation by using a visual scale. The information I have learned about motor planning has been immensely helpful to me as well. Jeremy often has a very difficult time getting his body to where it needs to be. He will often say things like, “Just move me there,” especially on days when he is having a particularly hard time with motor movement. Strategies covered in the online course are very helpful in these moments, or when I start to feel like Jeremy is “just being oppositional.” I know this is not the case. I am also bringing a new support to the table via this course. I will be creating a visual task analysis to support Jeremy in the steps of washing his hands. At present, Jeremy must be verbally, and sometimes physically, prompted to wash his hands. (See JameyLee Nuss’ article about this progression in Jeremy’s support at home.) I am hoping the visual prompt I develop will help foster greater independence for Jeremy in completing this task. In order to make the support, I took several photos of Jeremy as he moved through each step of washing hands. Together, these photos will become a set of steps for him to follow each time he must complete this task. See photo (right): This photo, putting soap on one’s hands, is one step in the task analysis for hand washing that Matt created for Jeremy. The greatest benefit that I have received from this course has been my increased ability to be understanding and patient with Jeremy. I have had experience supporting a few people with autism in the past, but I have never really had a solid understanding of evidence-based practices. As a result of this ignorance, I think that I have experienced a fair amount of unnecessary agitation and frustration, simply because I did not understand why the person I support would act in specific ways. I would blame myself for things that were really not my fault, and blame the person I support for things that were really not their fault. This course has proven to be particularly helpful in supporting me to support Jeremy, because he has notably more severe sensory, motor-planning, and communication difficulties than any person I have supported in the past. In addition to the course content, I have enjoyed the group discussions with fellow learners. I enjoy reading other people’s thoughts and opinions as we move through each module, as they often cause me to think about the material presented in a way that I otherwise wouldn’t have. See photo (right): The online course is interactive and builds community. 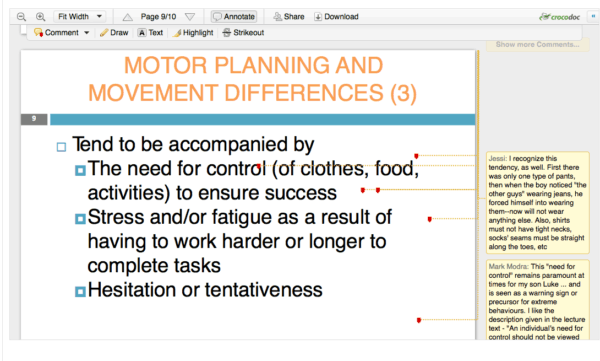 Here learners share comments on motor planning and movement differences. Matthew Murphy is a member of Jeremy’s Sicile-Kira’s in-home support team.